Methods Prospective longitudinal study of children (<6 years) where bruises were recorded on a body chart, weekly for up to 12 weeks. The number and location of bruises were analysed according to development. Longitudinal analysis was performed using multilevel modelling. Results 3523 bruises recorded from 2570 data collections from 328 children (mean age 19 months); 6.7% of 1010 collections from premobile children had at least one bruise (2.2% of babies who could not roll over and 9.8% in those who could), compared with 45.6% of 478 early mobile and 78.8% of 1082 walking child collections. The most common site affected in all groups was below the knees, followed by ‘facial T’ and head in premobile and early mobile. The ears, neck, buttocks, genitalia and hands were rarely bruised (<1% of all collections). None of gender, season or the level of social deprivation significantly influenced bruising patterns, although having a sibling increased the mean number of bruises. There was considerable variation in the number of bruises recorded between different children which increased with developmental stage and was greater than the variation between numbers of bruises in collections from the same child over time. Conclusions These data should help clinicians understand the patterns of ‘everyday bruising’ and recognise children who have an unusual numbers or distribution of bruises who may need assessment for physical abuse or bleeding disorders. A handful of published studies show bruising is unusual in non-mobile infants and increases as children become more mobile. The prevalence of bruises at different sites with respect to development is ill- defined as is the proportion of children who bruise more frequently than others. Bruising affects a small proportion of babies who cannot roll over. Rare sites for bruising: ears, neck, genitalia, hands, in any child and buttocks and front trunk in early and premobile children. Nine per cent of children have twice as many bruises as would be expected for their developmental stage. Paediatricians faced with a child with concerning bruising must distinguish between accidental bruising, physical child abuse and congenital or acquired bleeding disorders. They must therefore understand the patterns of bruising in children from day-to-day activities, and any influential factors. Studies show that bruising changes as children become increasingly mobile1–3 and is unusual in infants who are not yet mobile.3 However there is a small literature base defining ‘normal’ patterns of bruising.4 ,5 Accidental bruises are most likely to appear over the bony prominences, such as knees and shins, and on the front of the body.4 Chang described an occipital and ‘facial T’ distribution of bruises in children experiencing slips, trips and falls.6 Previous studies have used selected populations, such as children attending baby clinics and outpatient appointments,1–3 ,7 children who had other injuries, such as fractures,8 or children admitted to paediatric intensive care with head injuries.9 These studies give limited insight into ‘day-to-day’ patterns of bruising in children. This study aims to describe the number and distribution of bruises sustained from everyday activities and accidents in a UK population of preschool children, to explore between and within child variation, the changing pattern of bruises with stages of motor development, and the relationship between bruising and gender, ethnicity, season, sibling order and socioeconomic status. This prospective longitudinal study recruited children (age 0–6 years) from South Wales, UK. Parents were recruited from well-baby clinics, hospital outpatient clinics, and mother and baby groups in the local community. Children with clinically documented motor disability, confirmed bleeding disorders or suspected child abuse were excluded. Those with a family history of a hereditary bleeding disorder were included if coagulation testing had excluded the condition. The study had two phases: Phase 1 (April 2005–December 2007) and Phase 2 (April 2008–August 2011). The latter followed an amendment to the ethical approval that allowed us to collect additional data-fields. In phases 1 and 2, data were collected on gender, age, developmental stage and past medical history. In phase 2 we added ethnicity, family order and socioeconomic status based on the Townsend score11 and parents were asked to record the cause of the bruise when known. The postcode of the child's residence was mapped into the Lower Super Output Area (LSOA). Townsend deprivation scores have been calculated for all LSOAs, and grouped into five quintiles based on this score. The quintile of deprivation was taken as an ecological measure of deprivation for a child (5th quintile representing the greatest level of deprivation). Parents were trained to recognise a bruise as a non-blanching red/blue/purple mark that appeared on the skin, and record the number and location of bruises in their own home. They were trained not to record cuts, abrasions, birthmarks or other skin lesions. Bruises were recorded on a body map at a weekly data collection for up to 12 weeks. Once children were walking, four weekly collections were accepted. At each data collection parents recorded the most advanced motor developmental milestone achieved. Children were classified as premobile (subdivided into baby not yet rolling over and those able to roll over), early mobile (crawling or cruising) and walking. Some children were included for a subsequent 12 week period if they had progressed to a different developmental stage. Data from the two phases were combined for analysis where possible. A random sample of 40 data collections from 40 different children was selected to validate the quality and consistency of recording. The parent recorded the number, location and size of bruises (maximum diameter), and a single research nurse verified that the lesions recorded were bruises by independently repeating this process on the same day. The parents were not warned that the nurse would visit on the day to validate the data collection. Bruises were recorded in 38 different locations on the body. These were grouped into 18 after an initial analysis, combining contralateral locations where laterality was unimportant or where bruises were rare, for example, wrists (figure 1). The ‘facial T’ was defined as the forehead, nose, mouth (upper or lower lip) or chin.6 The ‘head’ refers to the area within the hairline. Bruises from immunisations or venipuncture were excluded. All data were entered onto an Access database using a process of double data entry. Categorisation of sites where the locations of bruises were recorded at each data collection. One thousand and two parents were approached to participate, 380 gave informed consent and 328 children (mean age 19 months, 54% female) had at least one collection, providing a total of 2570 data collections (590 collections from 52 children were from phase 1), with an average of 7.8 collections per child. Forty-two per cent provided 12 collections and 39% between 4 and 11, with three per cent providing more than 12 collections spread over more than one development stage. Forty children had collections spanning the premobile and early mobile phases and 27 spanned early mobile and walking phases. Ethnicity was recorded in 280 children; 269 were white British and 11 were in other ethnic groups (similar to the ethnic mix of the local population). The Townsend quintile was available for 245 children; 46% were from the least and 15% from the two most deprived quintiles. At recruitment 133 (41%) children were premobile, 43 (13%) early mobile and 152 (46%) walking. Some children changed developmental stage during data collection; 39% of the 2570 collections were in premobile children, 19% in early mobile and 42% in walkers. The validation process showed complete agreement between parents and the research nurse for the number and site of bruise recordings. For bruise size (within 5 mm) agreement was 55% (44/80); size is not included in this analysis. A total of 3523 bruises were recorded across all collections. The percentage of collections with at least one bruise, the mean number of bruises per collection, and the mean number of sites affected increased with incremental development stage (table 1). Because of multiple collections in a child, this table does not show the prevalence of bruising in children. The prevalence of bruising in the first collection for each child was 5.3% in premobile, 55.8% in early mobile and 87.5% in walking children. Twelve bruises were recorded in 9 of 405 collections (2.2%, 95% CI 1.2% to 4.2%) in children who were not yet able to roll over. The cause, when reported, included bumping into mother's tooth, falling asleep on a dummy, banging themselves with a fist or rattle and a toy that was dropped on one baby. There were 75 bruises in 59 of 605 collections (9.8%, 95% CI 7.6% to 12.4%), in children who could roll over but were not yet crawling. Examples of causes included 12 children who had fallen or toppled over, 7 rolled into something, 4 banged into an object and 6 hit themselves with an object. 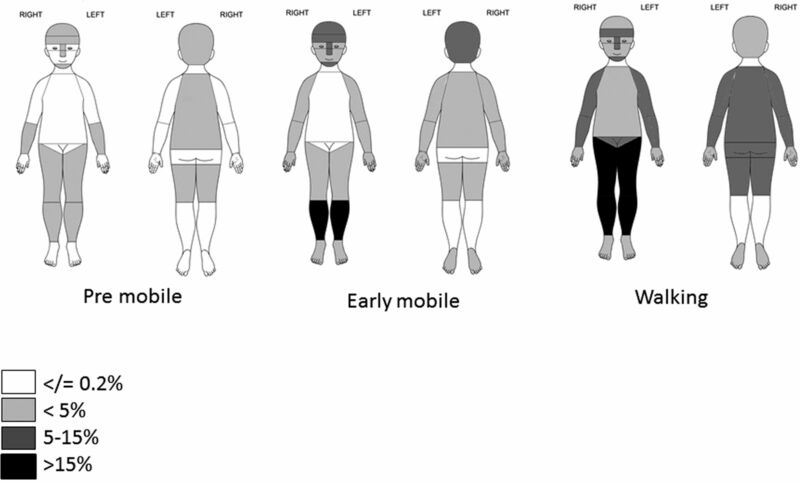 The most common sites for bruises in premobile and early mobile children were below the knees, the ‘facial T’ and head (table 2 and figure 2). In the walking group the most common site was below the knees, although many other locations were affected, notably the front of thighs, lower arms and rear trunk (where 78% of bruises were to the lower back). Some sites had numerous bruises. The mean number of bruises below the knee was 2.8 and to the front of the thigh was 1.4 in collections where at least 1 bruise was present. The ears, neck, genitalia and hands were rarely bruised (<1% of collections) in any developmental group. Buttocks and front trunk were rare sites (<0.2%) in premobile and early mobile children. When bruises to the front trunk were reported they occurred in children who were walking and 95% were over the bony prominences of the iliac crest, clavicle, ribs or shoulder. Distribution of percentage of 2570 collections from 328 children with at least one bruise by location and development stage. To assess the variation between children, the data were separated into different developmental stages. The majority of collections in the premobile children had no bruises and 73% (97/133) of children never had a bruise recorded over 1010 collections. For those with independent mobility, there was wide variation between children and for many children there was considerable variation between collections. For walking children the percentage of the total variation due to differences between children was 75.4%; for early mobile and premobile children the corresponding values were 60.5 and 41.8. For walking children, the majority of the variation was between children, suggesting that different children tend to sustain different amounts of bruising, but there was substantial variation between children for all developmental groups. For this reason a multilevel analysis was performed to analyse the data on collections nested within children. Fitting this model to the 1980 collections from phase 2, the estimated ratio, comparing the mean number of bruises in children walking with early mobile children, was 2.35 (95% CI 1.95 to 2.84). This means that a child who is walking would be expected to have more than twice as many bruises on average as an early mobile child. The ratio in premobile children compared with early mobile was 0.07 (95% CI 0.05 to 0.09). Table 3 shows estimates of these effects adjusted for: gender, seasonality, ethnicity, deprivation and the presence of siblings. These estimates are multiplicative effects, in that the risk ratios above are multiplied by these terms. Having a sibling significantly increased the mean number of bruises (the sibling order had no effect); season, ethnicity and gender effects were not significant. Although bruising was more extensive in the most deprived quintile, this result was not statistically significant. There was considerable variation in the amount of bruising a child displayed, even when adjusting for developmental stage and the above factors. More than nine per cent of children had more than twice the expected amount of bruising while five per cent had fewer than half the expected number of bruises. This large longitudinal study confirms a strong relationship between the presence, number and location of bruises and different stages of motor development. Bruising in babies who were not yet rolling over was uncommon. The percentage of collections with at least one bruise, and the number of bruises at each collection, increased with incremental developmental stage. The most common sites of bruising were below the knees, ‘facial T’ and head, while rare sites included the ears, neck, genitalia, hands, in any child and buttocks and front trunk in early mobile and premobile children. Other studies have shown that older children have more bruises than younger children.1–3 ,15–17 and two studies showed that bruising increased with developmental stage.1 ,3 For all developmental groups the prevalence of bruises in this study was greater than in previous studies (table 4). Explanations for this may include the method of data collection; parents may have been more vigilant in recording faint bruises that they had been monitoring for days prior to the collection date. It is possible that bruises that had not resolved over the weekly interval between collections may have been double counted. However the mean numbers of bruises were similar in the first collection for each child to those for later collections. Any bruise in premobile children raises the suspicion of physical abuse and while this could not be firmly excluded in every case, the probability of abuse in this population was low. The explanations given for the bruises, where available, were compatible with the bruise sustained. In the few cases where bruise pattern was deemed unusual, they were independently reviewed by a child protection team and abuse was excluded. There was no gender or seasonal variation contrary to the Canadian study.2 Seasonal weather patterns vary more dramatically in Canada than in the UK, and may affect children's lifestyles to a greater extent. The significant influence on the number of bruises sustained when a child was part of a sibling group may reflect lower levels of individual supervision or the effects of sibling play. The proportion of collections with below knee bruises increased with motor development, while head and ‘facial T’ bruises peaked in the early mobile group. Bruises became more widely distributed in the walkers. Sugar et al identified very similar distributions in the three equivalent developmental groups.3 Two smaller studies7 ,17 identified the high prevalence of below knee bruises, followed by the broad category of ‘head bruises’ in early mobile and walking children. Chang et al analysed craniofacial injuries and described a peak incidence of trips and slips in toddlers, and falls in those younger than 1 year.6 The most common site of bruising was the ‘facial T’, followed by the back of the head. These injury mechanisms may explain this distribution across the developmental groups. Bruises on the ears, neck, genitalia and hands were rare in any developmental group and buttock and front trunk bruises were rare in early mobile and younger children. A strength of the data set is that it included the anogenital area, excluded by previous authors.2 Sugar et al identified buttocks/hands/feet/abdomen/ upper arms as rare sites but did not mention ears or neck.3 Pierce et al detailed data on a highly selected group of 53 children younger than 48 months admitted to the pediatric intensive care unit with accidental trauma.9 Bruises were identified in 38 children, a similar profile of rare sites for accidental bruising was identified. Examples of causes of bruises were given, particularly in the premobile and early mobile children. As missing data in this field may represent either no knowledge of the cause, or a failure to record the information, we could not interpret how frequently parents know the cause of each bruise. This study design has the benefit of prospective data collection using a consistent approach. The study relied upon the co-operation of 328 parents to collect data. The less socially deprived population was over-represented in our sample, possibly reflecting parental willingness to comply with the study, but this should not bias the associations with bruising. Study compliance varied in terms of the length of time each participant was involved, and while we cannot be certain that every single bruise was collected we have a high degree of confidence in our participants, verified by our validation of data collection accuracy. Recruitment to the study was challenging as it required prolonged participation. The informed consent described the reasoning behind the study, including a need to identify normal patterns of bruising to compare with bruising in child abuse. Parents were informed that a referral to social services would be made if child maltreatment was suspected. This information tended to dichotomise our target audience so that parents were either highly motivated to participate or vehemently declined. This may have impacted on willingness to participate. Each collection was scrutinised and at no time was a suspicion of abuse raised and no child was referred to social services during the study time period. These data have the potential to alert clinicians to an unusual number or distribution of bruises in young children. Multiple bruises in premobile babies and bruises in locations other than the ‘facial T’, head or below the knee would be an unusual finding as would bruises to the ear, neck, hands or genitalia. Thus these data create invaluable baseline information for those assessing bruises in children. The study team thank all the parents who participated, Amanda Summers for data entry and paper formatting, Ciara Harris for assistance with double data entry, Rebecca Morris and Ana Guerrero for recruitment and Bryn Jenkins for database design, and NISCHR research nurses Pauline and Anne Russell for data collection.
. Childhood bruising. Practitioner 1990;234:598–601.
. Health and deprivation: inequality and the North. Croom Helm London, 1988.
. An introduction to generalized linear models. 3rd edn. Boca Baton, FL: Chapman and Hall/CRC, 2008. ISNB 1-58488-165-8.
. Bruising in healthy 3-year-old children. Matern Child Nurs J 1982;11:165–79. Contributors AMK: Principal investigator and main author of the paper, study co-ordinator, and contributed to project design, some data analysis and wrote the main body of the paper. FD: Project co-applicant, statistician responsible for the data analysis and writing the analysis within the results section, project steering group member and contributed to project design. DN: Project steering group member and research nurse responsible for data collection, data entry, data cleaning, research governance and design of project resources. MH: Haematologist, and contributed to data collection and project design for the first part of the study, and had editorial responsibilities for the manuscript. PC: Co-applicant, haematologist, co-writer of the manuscript, project steering group member and contributed to project design. SM: Co-applicant, project steering group member, co-writer and contributed to project design. AMK had full access to all the data in the study and takes responsibility for the integrity of the data and the accuracy of the data analysis. Funding The MRC funded the research team who undertook the study; Baxter Healthcare funded a clinical fellowship for phase 1 of the study. Ethics approval Southampton REC B on 14 January 2005 and amended in October 2007. No. 05/MRE11/8. Data sharing statement We have a database that will be archived once the study analysis is kept. The data will be kept for 15 years in line with University governance recommendations. We would be happy to consider any request for data access. However the purpose would need to comply with the original ethical approval which may be limited as parents had consented to provide the data for specific purposes.